A defense that can’t afford losing any key players just got a whole lot weaker after Sean Lee tore his ACL which means he’ll miss the entire 2014 NFL season for the Dallas Cowboys, once again finding themselves without a player they were counting on to lead the defensive unit. 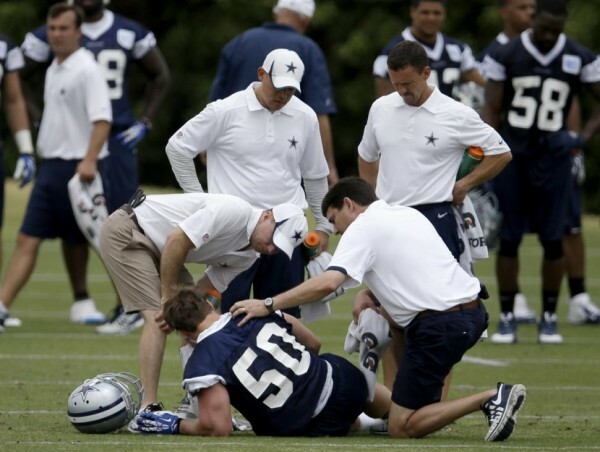 The 27 year old linebacker took a bad slip while getting blocked by rookie tackle Zack Martin, and Lee had to be helped off the pitch and led into the locker room. Later in the day it was confirmed that he tore his left ACL. Lee, who played college football for Penn State, tore his right ACL for the Nittany Lions in 2008 and partially tore his left ACL a season later. For the Cowboys, since being drafted by them in the second round of the 2010 NFL draft, he was relatively injury free during his first two seasons, but played only six games in 2012 because of toe surgery, and he missed five games in the 2013 season, which didn’t stop him from leading the team in interceptions with four. Lee was signed on a six-year extension last summer worth as much as $51 million which included a $10 million signing bonus, with the base value being $42 million and Lee with a chance to make up to $9 million if he had played more than 80% of snaps. A player the Cowboys were clearly counting on to lead this defense when healthy, but someone proving to be untrustworthy because of how often he breaks down. I don’t really know what happened. Two guys playing hard, running to the ball. We’ll see what happens. … Hope for the best. He’s obviously a great player, leader of the defense. Jason Garrett, who failed to make the playoffs again last season and has to be thinking about his job being on the line, whether or not he is the one in charge of the defense, didn’t have anything unique to say except complementing Lee and saying he knows he’ll do everything to get back as quickly as possible, but it’s unlikely it’ll happen this season. Sean has had to deal with injuries throughout college and also here in the NFL. He really does everything he can to get himself ready to play. Unfortunately, he had to deal with a few of those things, but he’s as mentally tough as an individual I’ve ever been around. Whatever the circumstances are, he always puts his best foot forward and strives to be his best. I don’t anticipate this being any different. The Cowboys had a chance to take C.J. Mosley with their first round pick but opted against selecting the Alabama linebacker, which might seem to be a mistake now. However, many feel that Mosley wouldn’t have been adequate in a 4-3 system that the Cowboys switched to last season. Lee’s injury might give a chance to rookie Anthony Hitchens, a fourth round pick, to get immediate playing time, and there’s also Oriel Lemon, although we might see one of the side linebackers get shifted to the middle.